Our company has been acknowledged in offering Envelope to the clients. This product is ingeniously designed by skilled professionals using the supreme quality paper. Offered range is used for placing gifts and documents for special occasions such as marriage ceremonies and birthdays. 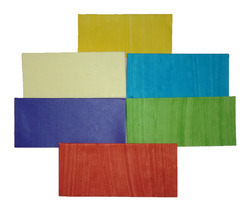 This product is available in standard sizes, colors, designs and shapes. This product is eco-friendly, non toxic, easy to write on, and tamper proof. Envelope is ideal for retail shipping stores, Internet based Business, Pharma Industries and for flat auto parts such as gaskets, 'o' rings, etc. Established in 1990, Pooja Craft & Embroidery, is a renowned manufacture, supplier, wholesalers and traders of decorative basket, artificial flower, artificial flower bunches, rangoli designs, chocolate decoration material, wedding decoration material, candle making material, emboss painting, glass painting, school decoration material, fancy paper boxes, handicrafts trays etc and caters to hotels, restaurants, bungalows, school, households-etc. We offer free samples of our catalog products and are committed to meet our orders timely. Our Products and Services are available from 7 am in the morning till 12 pm in the evening.